The report “Rare Gases Market by Type (Neon, Xenon, Krypton), End-Use (Manufacturing & Construction, Electronics, Automotive, Healthcare), by Transportation Mode (Cylinders, Tonnage Distribution, Bulk Delivery), by Function (Illumination, Insulation) & by Region - Forecast to 2020;, defines and segments the rare gases market with analysis and forecasting of the global revenues for rare gas applications. It also identifies the driving and restraining factors of the market with analyses of trends, opportunities, and challenges. The segmentation considered for this report is based on type, end use, transportation mode, function, and region. The market has been segmented on the basis of type into krypton, xenon, and neon. The market for xenon is projected to witness the fastest growth between 2015 and 2020. The market has been further segmented on the basis of end use into manufacturing & construction, electronics, automotive and transportation equipment, and healthcare. Based on end use, the electronics segment is projected to grow at the highest rate between 2015 and 2020. The functions of rare gases include illumination, insulation, and others such as scanning. The illumination segment accounted for the largest market share of the total rare gases market in 2014. By transportation mode, cylinders and liquid containers are projected to have the largest market share during the forecast period. The Rare Gases Market is projected to register at USD 380.9 Million by 2020 at CAGR of 7.68% from 2015 to 2020. Factors such as new energy-efficient codes, increasing oil prices, demand for “greener” building structures, increasing electronics industry, and government mandates are contributing to improvements in the development of more energy-efficient technologies using rare gases. However, other gas applications such as argon and helium have also been able to provide similar but less efficient equipment at a cheaper cost. Overcoming the imbalance between the global demand and supply is a challenge faced by players in the rare gases market. 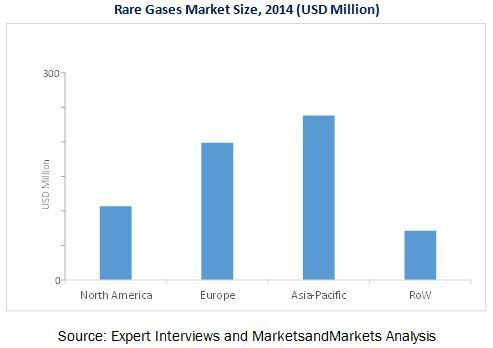 Leading players in the rare gases market include Praxair Inc. (U.S.), Airgas Inc. (U.S.), The Linde Group (Germany), Air Liquide S.A. (France), Air Products and Chemicals Inc. (U.S.), Messer Group (Germany), and Iceblick Ltd. (Ukraine). One of the main strategies adopted by companies in this market is mergers & acquisitions. Companies are also constantly investing in research & development activities to generate new ways to expand the market of rare gases to suit the growing technological requirements of various applications. Companies are adopting inorganic growth strategies such as acquisitions to cope with the increasing demand for rare gases in key emerging markets. These strategies have helped companies to create a large customer and partner base in key markets.